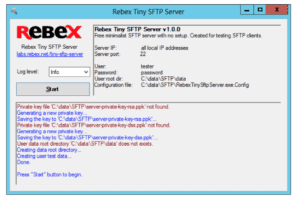 Rebex Tiny SFTP Server was designed for testing SFTP Clients. Like the name says, it is a small application and requires no installation or setup. Although not as capable as many of its competitors, it is perfect for small jobs where a full server is not needed. Allows for Quick Transfer of Secure files between Computers and across any Network. FREE to Use, even for Commercial purposes! Windows 7 SP1, 8, 8.1, 10 and later. Windows Server 2012 or later. Windows XP, Vista, 7, Server 2003 or 2008. You might have to install .NET 4.0 first when using the server on these older systems. Denise Porter Denise is one of our Staff Writers that has transitioned from the Corporate IT Consulting World into publishing. She enjoys writing about her Experiences with Software and Tools that she has used and help implement in Real-world Scenarios and Business. She has a Master in Organization Development from Seattle University.